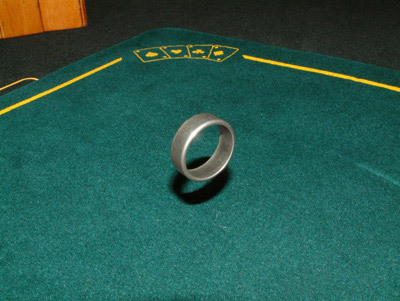 The Wizard PK Ring is a complete, 100% Neodymium Rare Earth Magnet fashioned into a ‘wedding band’ style ring. It will give you a host of unique opportunities to amaze and impress, limited only by the extent of your imagination. To get you started we have set out two basic routines for you to try. 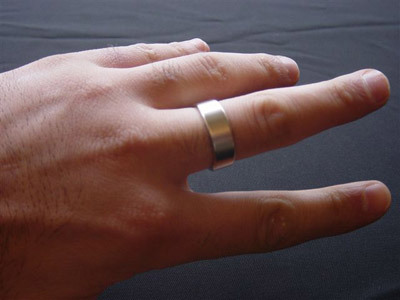 The beauty of the ring lies not only in how it looks, a ‘wedding band’ on your finger looks completely natural to any spectator, but also in the fact that the ring does all the work for you. There is no need for you to conceal anything – a rare treat. "It’s about flippin’ time someone came up with a totally innocent looking band ANYONE could use. No more HUGE skull, gem or pentagram encrusted beasts. No having to wear it in any odd way to get to work with it. This is the proper job." Q. Is this PK Ring available in men's size 12? Simply enter your details below and we will send you an e-mail when “Wizard PK Ring (SILVER, 17mm, Flat Band) by World Magic Shop” is available to ship!